MPs have just voted against having a “Norway model” arrangement with the EU after Brexit. FIVE JUNIOR LABOUR MPs and a shadow minister have quit in an act of rebellion ahead of another key Brexit vote this evening. The politicians quit their posts in protest against their party’s handling of Brexit votes – specifically on its decision to abstain from a vote being held tonight. According to the Sun, they are shadow cabinet office minister Laura Smith, Ged Killen, Ellie Reeves, Tonia Antoniazzi and Anna McMorrin. The Guardian reports that around 75 Labour MPs defied the whip by backing the EEA amendment – 74 by voting in favour, and one by acting as a teller. A further 15 voted against the amendment, bringing the number who defied the party whip to 90. This places pressure on Labour leader Jeremy Corbyn, who has been accused of being too soft in opposing the government’s stance on Brexit. Although Corbyn has said that he’s a ‘remainer’, he’s been accused of being anti-Europe prior to the June 2016 referendum. The resignations came ahead of another key Brexit vote being held on whether the UK wanted its relationship with the EU post Brexit to be based on the “Norway model”. But MPs voted 327-126 against the House of Lords’ amendment in Withdrawal Bill which would have forced the government to negotiate remaining in the EEA (that’s the Norway model). 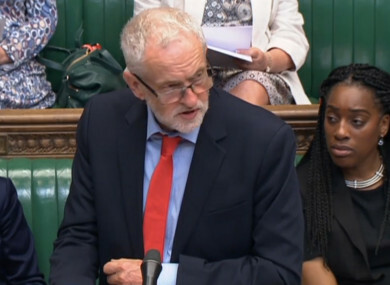 Labour had decided to abstain from the vote, which prompted the initial criticism of Corbyn that led to the resignations. ‘Remainer’ MP Dominic Grieve told Sky News after the vote that he voted against the government and in favour of “the Norway model” as a symbolic gesture. He said that Norway can control its agriculture and fisheries sector and that those who wanted to leave the EU had advocated this model before the referendum. “We want to express the view that it shouldn’t be ignored,” he said. This week, rows have been brewing at Westminster relates to the flagship EU (Withdrawal) Bill, which sets the legal framework for Brexit and would transfer thousands of European rules into British law. The Scottish Parliament has refused to approve the bill because it could mean powers currently held by Brussels are moved to London, even when they relate to devolved areas – Scotland, Wales and Northern Ireland. Earlier today, the Scottish National Party leader Ian Blackford, used a parliamentary procedure to try to disrupt the weekly prime minister’s question time, calling for an immediate vote on a motion for MPs to sit in private. The speaker agreed to discuss the issue once question time was over but when Blackford refused to take his seat, ordered the Scot out of the chamber for the rest of the day. The reason the SNP acted this evening was because the government allowed no time for MPs to debate devolution issues in the bill last night, in what would have been their last opportunity to object. Blackford said the lack of debate was a “democratic outrage” and said the situation had become a “constitutional crisis”. A Downing Street source dismissed the protest as a “stunt”. The source said the government had held talks with Scotland for a year and the Welsh Assembly in Cardiff had accepted its devolution proposals. “The vast majority of powers that come back from the EU in terms of the devolved administrations will go directly to Belfast, Edinburgh and Cardiff,” the source said. Northern Ireland’s Stormont Assembly has been suspended for more than a year after Sinn Féin pulled from the power sharing agreement with the DUP over the cash-for-ash scandal. Email “Six Labour MPs resign before Brexit vote in another turbulent day at Westminster”. Feedback on “Six Labour MPs resign before Brexit vote in another turbulent day at Westminster”.